Lois Blais was born in North Bay, Ontario on February 6, 1938. 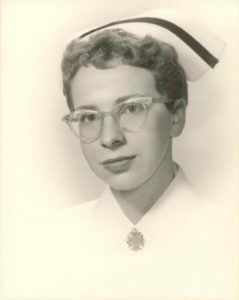 She received her RN Diploma at St. Michael’s Hospital School of Nursing in Toronto in 1959, and in 1967 completed her B.A. in English and philosophy at UBC. She returned to university in 1993 to enroll in the Masters in Nursing program at UBC, completing the program in 1996. Her major paper for this degree was on moral agency. Lois worked at St.Paul’s Hospital, Vancouver, for most of her career, from 1969 occupying a number of senior administrative positions. She was also Head Nurse for the Cancer Control Agency of British Columbia from 1977-1981. Lois was also active on many RNABC nursing committees, including Public Relations, Programs, and Philosophy and Nursing Practice; she was also Director-at-Large for the Board of the RNABC from 1976-1979. She chaired the British Columbia Institute of Technology Med/Surg Advisory Committee from 1986-1988 and later was a member of the same committee. From 1987-1989 she was President of the Vancouver Metropolitan chapter of the RNABC. She received an Award of Honour from RNABC in 1994, and later chaired Langara College’s Holistic Health Program Advisory Committee. Lois’ community involvements included membership on the Communication Committee and Selections Committee for the West Side Community. She was also a member of the Interim Steering Committee for the development of a Community Health Council in the West Side. During the 80s Lois took a break from her nursing career to assist in building a 36 ft. Wharram Catamaran. From 1981 to 1983 she sailed 15,000 miles off shore, including voyages to Mexico, Hawaii and Micronesia. 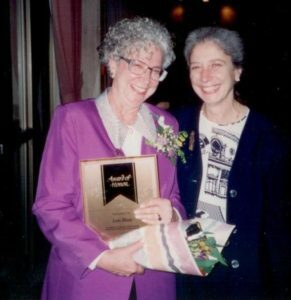 After retirement in 1999, Lois joined the History of Nursing group, where she became successively treasurer, vice-president and president, and also chaired the Archives Committee. She also studied energy-alternative therapies and was an Integrative Energy Healing Practitioner. Lois contributing a monthly column to the seniors’ section in the Vancouver Courier. She died on August 31, 2008 after a valiant battle with cancer. Fonds consists of 29 cm of records related to Lois’ education, career, and diverse interests. Records of her personal and educational career include transcripts, certificates and photographs. Records of committees on which she served include the Integrative Healing Steering Committee, the Centre for Holistic Studies Advisory Committee and the Editorial Board Committee. Her presentations include “Reflections on the Art of Living: Myths and Symbolism with Lois Blais” and “The Harrower Collection”, an unfinished project on Madeline Harrower, a nurse during the Boer War and World War I. Her publications include a series of articles in the Vancouver Courier. See also Lois Blais’ biographical file.